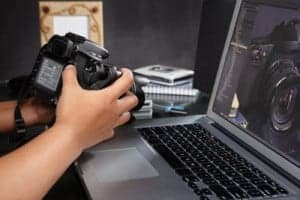 This guest post was written by Robert Brandl, who runs WebsiteToolTester.com – a website offering advice on the creation of photography websites and other personal or small business websites. How do you share all those great photos you took at the weekend? Even if you are not a professional photographer (yet), chances are that you want to share your work with friends and family. Sure, there’s Facebook, Flickr, Google+ and similar platforms for presenting your portfolio online – but most of them don’t really offer much scope for adding your own style and personality to the presentation of your photos. Just think how cool it would be to have your own personalized online portfolio! But how do you go about creating one? If photography is still mainly a hobby for you, hiring a web designer is probably out of the question at this stage. And, unless you’re a bit of an IT geek yourself, using an open source content management system like WordPress.org or Joomla can be quite tricky. You wouldn’t be the first to spend hours trying to get your head round FTP connections, databases and templates while your initial enthusiasm is slowly fading away. Don’t get me wrong: especially WordPress is a great platform, and if you’re willing to invest the time it takes to get the hang of it you can do fantastic things with it. There are thousands of brilliant design templates available that can be bought for usually less than US $50. However, if you prefer an easier option I can show you some interesting alternatives. Most providers have detailed online support sections or offer individual support by email, which is very handy for beginners. While online website builders usually give you plenty of storage – even with their free plans – it’s important to note that there is one thing you will not get for free, and that’s your own domain name (e.g. yourname.com). What they will give you instead is a subdomain, e.g. yourname.theirname.com – which is fine for a personal site, but not for a professional photographer’s portfolio. However, you can always purchase your own domain name, either through the website builder company itself or from an external domain name registrar. Weebly gives you unlimited web space, even on their free plan, and sports a pretty decent photo gallery feature. It is very easy and intuitive to use too. Weebly’s designs may not be quite as stylish as those of their competitors, but it is nevertheless becoming an increasingly popular choice for photographers looking to set up a completely free website. Weebly does place an ad on your site, but it’s only a grey logo in the footer section. So your visitors will probably not even notice it. Jimdo wants website creation to be fun and easy for everyone. You can choose from plenty of pre-built designs and it’s also quite easy to customize them to your own preferences. It includes a very good image gallery feature and also enables file downloads in case you want to share the source files of your photos. If you only want to share them with selected people you can even password-protect them. Jimdo offers a free plan that is sponsored through an ad on your site. Alternatively, for the price of US $5 a month, you not only get rid of the ad but also get your own domain name and email account. Wix is completely based on Flash technology. This means it offers some quite interesting visual options that are popular with photographers. Unfortunately, it also has its disadvantages: neither Google nor Apple are big fans of Flash websites, which may affect your search engine ranking, and iPhones or iPads will not show your Flash site at all. There are workarounds for this, however: Wix offers a dedicated mobile website editor to address the iPhone issue. If your main concern is to have a website that looks really great and you’re less worried about SEO and mobile access you should definitely check out Wix. Another way to share photos is through blogging platforms like Tumblr or WordPress.com (the hosted version). These services are also free and allow you to create content in the familiar reverse-chronological blog format, i.e. with the most recent post appearing at the top. These two services give you an interesting additional option: you can enable a secret email address to which you can send text and photos. The email is then automatically converted into a blog post. This is great if you want to get friends and family to share photos to your blog. With WordPress it is also possible to create static pages and organize your images into photo galleries. WordPress does put ads on your blog, but you can also upgrade to a ‘No-Ads’ plan. Wordpress.com generally has a steeper learning curve than Weebly, Jimdo or Wix, but offers some great features that are especially relevant to anyone who wants to post frequently. If you want to use it commercially you should familiarize yourself with their T&Cs as commercial usage is somewhat restricted. Tumblr is easier to use than WordPress, but options for static pages are very limited. I would mainly recommend it if you want to share photos quickly and easily – especially if you want others to be able to upload photos too – and as long as you’re not too worried about the order they appear in. Creating a website can be fun and doesn’t have to cost you anything apart from your time. Check out which website builder or blogging platform has the best features for you and give it a try. Most providers offer rather generous free plans with plenty of storage and no time limit. And, of course, you can always upgrade to one of their premium packages later. Having said all this, don’t cancel your Facebook account just yet. Social media sites are still a great way to share links to your latest photos – only this time you can take your friends to your new website instead. Please leave us a comment and let us know what you think.